I've heard that "persistance trumps talents". OK, I may not be the greatest writer, but I'm persistent (if also brief), lets see if this persistent blogging pays off. 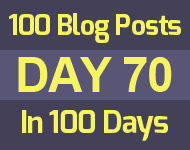 In about 30 days time when I will have done 100 super-micro-micro-blogs.